The Constitution of Nepal, 2072 BS has the provision of seven provinces in Nepal. The government has decided to form 744 local units across the country, by the Local Level Restructuring Commission. People accessing services from 3,157 VDCs and 217 municipalities in the past will now have to go to 6 metropolitans, 11 sub-metropolitans, 248 municipal councils and 479 village councils for official works. The constitution grants 22 absolute powers to the local units while they share 15 more powers with the central and provincial governments.These provinces have been created on the basis of their geography, resources and economic efficiency. However, they may differ in their strength from one to another. Province No. 7 located the same boundary of far-western development region. There are three geographical features in this province: the Himalayan in the north, the Hilly in the middle and the Terai in the south. The river Kamali flows in the east and river Mahakali drains the border in the west. It borders India in the west as well as south and Tibet (China) in the north. Thus, the region has good potentiality of external trade. It is the second smallest province of Nepal. Mt. Api (7132 m.) and Mt. Saipal(7025m) Mt.kapahad (6644m), Mt. Lassa (6189m) are the major Mountain peaks of this province. Khaptad and Ghodaghodi lakes fall in the province. Khaptad National Park and Shuklaphanta National Park conserve a lot of living and Don-living things. Api Nampa Conservation Area lies in the same province. The major trade centres of this province are Dhangadhi, Dadeldhura, Mahendranagar, and Dipayal. The principal crops grown in this province are wheat, mustard, maize and cotton. The province is remote and developmental challenged. Some 44% of people in the Far West Hills and 49% in the Himalayan districts live below the poverty line. The province has limited access to basic services. It has complex socio-economic structures and there is both widespread gender- and caste-based discriminations. Likewise, this province is badly affected by Dowry Pratha, Deuki Pratha, Chhaupadi Pratha, etc. 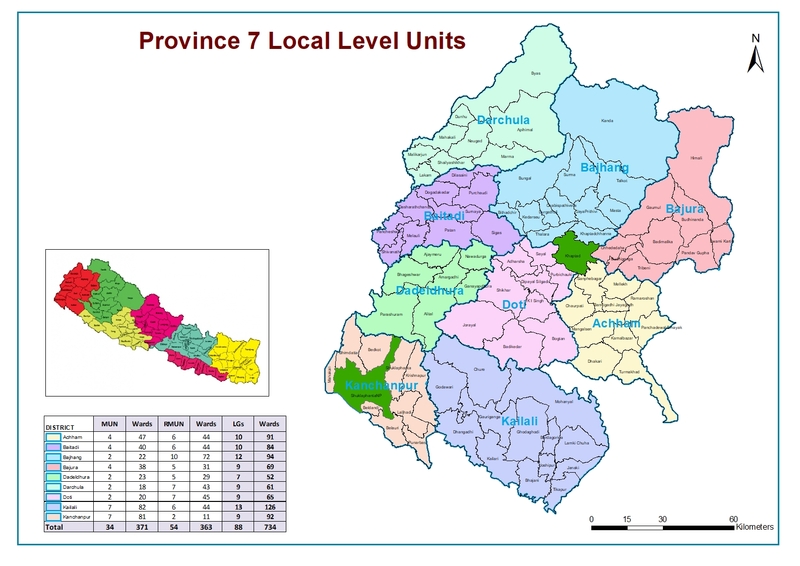 In addition to this, other traditional systems associated with the province, its culture and customs also pose impediments for overall development.At province no 7 there are 34 municipalities including one sub-metropolitan and 54 rural Municipalities (Gaunpalika) total 88 local units are functional as local government.